Inside The Belly of a Soundtrack from Wiggy (Ian Wiggins) on Vimeo. INSIDE THE BELLY OF A SOUNDTRACK is a work-in-progress to fuse music cultures to create an original soundtrack for the film “Inside the Belly of a Dragon” by British co-directors/writers Ian Wiggins and Hugh W Brown. 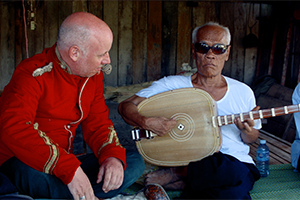 The soundtrack project brings together the musicians of Kampot Traditional Music School for Orphans and Disabled lead by Uon Sambo as well as The Cambodian Space Project’s Julien Poulson on guitar and Rob O’Hara aka Mute Speaker mixing in electro sounds and samples. We begin our work at KAMA house by assembling a team of local and international musicians and filmmakers who aim create a film score by performing live to a screening of Inside The Belly of a Dragon, responding to the essence of the moods and scenarios captured on screen as well as mood maestro Jitterbug Jackson (Hugh’s alter ego) an Irish clown, conducting the music ensemble.